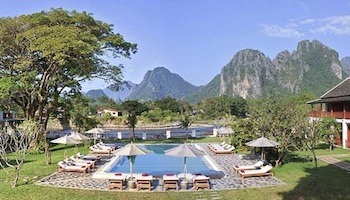 Laos provides a pleasant change of pace for travelers who are used to Thailand or Vietnam. 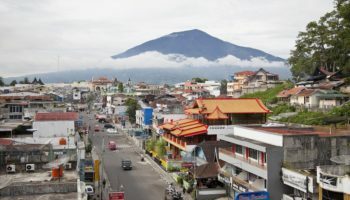 This small Southeast Asian country has stunning scenery, from limestone mountains to dense forests and spectacular waterfalls. It’s a great place for adventuresome travelers or those who don’t mind roughing it. Some of the best places to visit in Laos can be difficult to get to, but it’s all part of the adventure of exploring a developing country known for its ethnic peoples. The Bokeo Nature Reserve was created to protect its population of the black-cheeked gibbon, rediscovered in 1997, which was previously thought to be extinct. A visit to Bokeo Nature Reserve is not complete without a stay at the Gibbon Experience, an eco tourism conservation project. 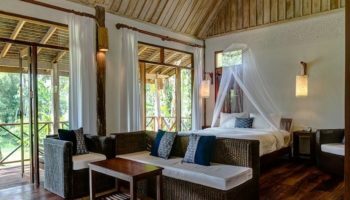 Guests stay in tree houses and travel by zip line through the forests in search of the Black Gibbon. Besides the elusive black gibbon, visitors to the reserve may also see elephants, bears, tigers and wild buffalo. The Gibbon Experience also works to rehabilitate and return to the wild animals that were captured by poachers. With mountains ranging from 1,600 to almost 5,000 feet in altitude, the reserve also is a good place to watch birds. Nong Kiau, sometimes called Nong Khiaw, is a popular tourist destination in Luang Prabang Province because of its many walking, mountain climbing and biking opportunities. A must-see site is the bridge across the Nam Ou River that was built by China. The bridge connects the two parts of Nong Kiau, and is a good place to see stunning views of the river and mountains. 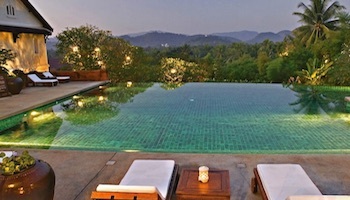 Nong Kiau is a rustic village, so visitors shouldn’t expect truly luxurious accommodations. Spelunkers may enjoy exploring the Pha Tok Caves that are located about a mile from town. The caves housed villagers during the Second Indochina War. Tham Kong Lo, also known as Kong Lo Cave, is a limestone cave in Phu Hin Bun National Park. Located on the Phu Hin Bun River, the cave has been described as a geological wonder of Southeast Asia. The karst cave is more than 6,5 km (4 miles) long and up to 91 meters (300 feet) high. It contains an emerald-colored pool that locals believe is sacred, saying it reflects the skin color of Indra, a Hindi god. Previous cave visitors praise a boat ride through the cave, calling it a grand adventure. Staying in a private home is easy to arrange for those in need of overnight accommodations. The provincial capital of Luang Namtha is the largest city in northwest Laos. It is a destination popular with backpackers, many of whom stop here while hiking from China to Laos. It is a good place to start treks into the hills to visit ethnic hill tribes. Renting a mountain bike or motorcycle is a good way to travel to nearby villages and waterfalls. After a day’s ride, visitors can relax with an herbal sauna. Night markets offer an opportunity to sample a wide variety of local foods cheaply. Wat Phu (or Vat Phou) is a ruined Khmer temple complex located at the base of mount Phu Kao, in the Champasak province. The Hindu temple structures date from the 11th to 13th centuries. It was a part of the Khmer empire, centered on Angkor to the southwest in Cambodia. Wat Phu is small compared with the monumental sites at Angkor but the tumbledown pavilions, enigmatic crocodile stone and tall trees that shroud much of the site give Wat Phu a mystical atmosphere. Si Phan Don (meaning 4,000 islands) is a beautiful set of islands, set against a scenic section of the Mekong River in Southern Laos. 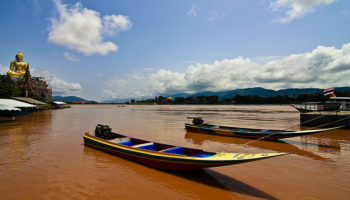 The Mekong is impassable to river traffic here due to the Khone Falls, a series of rapids that stretch 9.7 km (6.0 miles) of the river’s length. 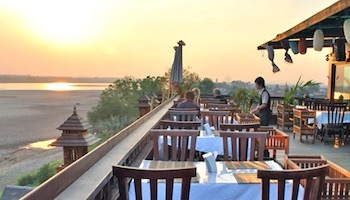 The Mekong below the falls has a small population of the highly endangered Irrawaddy Dolphins. The three principal islands that cater to tourists are Don Det, Don Khon and Done Kong. Most of the lodging available consists of simple, family run bungalows. Bikes and kayaks can also be rented here. Phonsavan, a name that means “hills of paradise,” is a good place to experience the U.S.’s Old West, only with Laotian characteristics. Since cattle raising is one of the city’s main businesses, it’s not uncommon to see Hmong “cowboys” wearing violet and brown cowboy hats. The city even hosts bullfights during Hmong New Year. Phonsavan is a good place to visit the Plain of Jars with its ancient megalithic structures that resemble jars. At one time, Phonsavan belonged to Siam, now Thailand, and then the French, with remnants of each culture still to be found. Vang Vieng is a tourist city about a four-hour drive from Vientiane. Originally settled in the 14th century when it was known as Mouang Song, it was given its present name when Laos was a French colony. It is best known for its limestone karst hills. Because it is located on the Nam Song River, many tourist activities, including kayaking and tubing, revolve around the river. 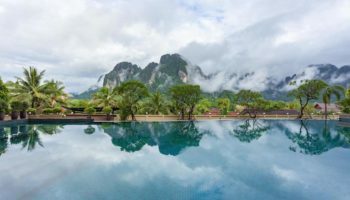 Vang Vieng is popular with backpackers who enjoy the relaxed atmosphere as well as hiking in the hills and exploring caves. Ethnic villages, including Hmong, are located close by. The Laotian capital of Vientiane, located on the Mekong River, was a French colony at one time, so visitors can expect to see traces of French influence, including street signs in French. 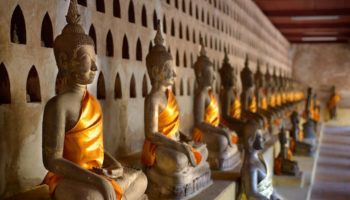 The most popular tourist attraction in this city, also known as “the city of sandalwood,” is a Buddhist stupa, Pha That Luang, which dates back to 1586. The stupa stands 49 meters (147 feet) tall and is believed to contain relics of Buddha. Wat Si Muang, another popular site, is built on the ruins of a Khymer Hindu shrine. The city is a good place to buy silk. 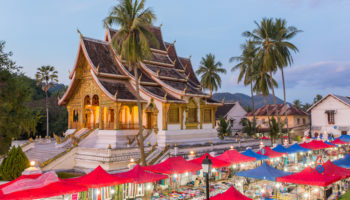 The most popular place to visit in Laos, Luang Prabang is an historic city that once served as the capital of the Kingdom of Laos. 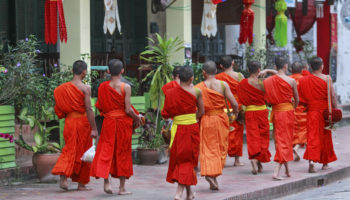 Located at the confluence of the Mekong and Nam Khan rivers, the city has numerous Buddhist temples and monasteries, with monks walking through the city collecting alms in the morning. There are several waterfalls nearby, some of which offer elephant rides to visitors. 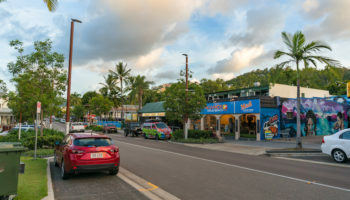 A night market at the end of the town’s main street is a good place to buy souvenirs. Adventuresome eaters might want to try fried Mekong River moss, which is a local delicacy. Which destination do you consider the best place to visit in Laos? this is such a great list! 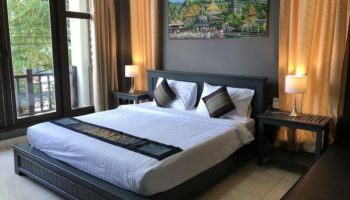 i’m heading to Laos tonight for the next few days (or weeks…) and am so glad I found this article to help plan my trip! many thanks!